Home Care of Mountainside/Salt Lake City Area with the 2016 Best of Home Care – Provider of Choice award! | BrightStar Care " "
BrightStar Home Care of Mountainside/Salt Lake City Area awarded the 2016 Best of Home Care – Provider of Choice award! Home Care Pulse honors BrightStar Home Care of Mountainside/Salt Lake City Area with the 2016 Best of Home Care – Provider of Choice award! We are proud to share this outstanding accomplishment, and we are happy to be recognized as one of the top home care providers in the nation. The ever increasing competition in the home care industry requires providers to set themselves apart from their competition. I can’t think of a better way of doing that than by demonstrating to your current clients, future clients, caregivers, office staff, and referral sources that you’ve been recognized as one of the top Home Care Providers in the nation, based upon the outstanding quality of care BrightStar Care of Mountainside/Salt Lak City Area provides. 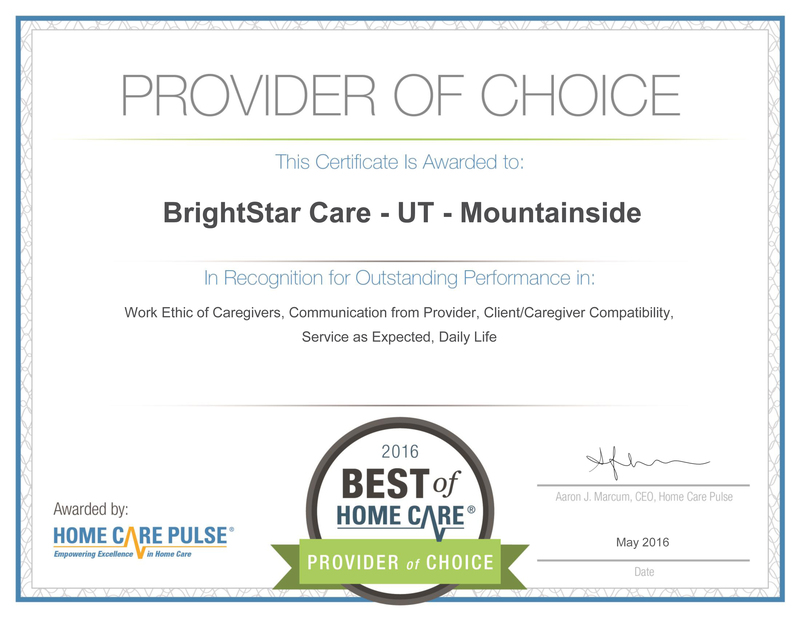 Moutainside, UT – BrightStar Care of Salt Lake City announced today that it has received the Best of Home Care Providerer of Choice Award from Home Care Pulse. The Employer of Choice Award is granted to only the top ranking home care providers, based on employee (professional caregiver) satisfaction scores gathered by Home Care Pulse. BrightStar Care of Salt Lake City is now ranked among the best employers of in-home caregivers in the region. Best of Home Care Provider of Choice award-winning providers work with Home Care Pulse to gather feedback from their caregivers via live phone interviews each month. Because Home Care Pulse is an independent third-party company, it is able to collect honest and unbiased feedback. These award-winning providers have received the highest satisfaction scores from their caregivers in areas such as training, office communication, caregiver/client compatibility, and overall job satisfaction. “At BrightStar Care of Salt Lake City we believe it is important to demonstrate excellence and this award show that that we are dedicated to providing excellence in home care.” says Alex Brown, Owner. BrightStar Care of Mountainside/Salt Lake City Area proudly provides Home Care and Support for Seniors, including 24 hour in home care, and support in independent and assisted living communities. We provide all levels of home care from companion services to Skilled Nursing. Medical Staffing, Home care, In-Home Skilled Nursing, In-Home Physical Therapy for pediatric, adult and geriatric patients, Companion and Personal Care for Elders with Alzheimer’s or Dementia. We also provide Home Child Care, Sitter and Nanny services for Children and Support for New Mothers. We Support Veterans as a partner of the VA/Veterans administration provider network and are a Home Care Provider for U.S. Department of Labor, Division of Energy Employees and Occupational Illness Compensation. We Accept most Long Term Care Insurance benefits, provide Hospice care, Live-in care, CNA, Caregiver, RN, LPN, RN Supervision, Compassionate Care, and Compatibility Guarantees. We are an ALS Society partner, Alzheimer Association member, and provide care for developmentally disabled and individuals of all ages with mental health and behavioral health diagnosis. Other services include safe discharge and transportation from the hospital or rehab facility, Post Op care both short and long term, Pre-Operation and preparation help and assistance, client monitoring for out of town family members. Proudly serving Sandy, Draper, Midvale, Salt Lake City, Park City, South Salt Lake, Mill Creek, Holladay, and Murray in UT.